Using Assignment Groups allows you to organize the assignments in your course. Type the Assignment Group Name in the Group Name field . If you want to weight the final grade for students using assignment groups, the percentage will appear in % of total grade field . Note: You must create assignment groups before you can assign percentages to each group. Learn how to create assignment shells and assignments for your Assignment Group. 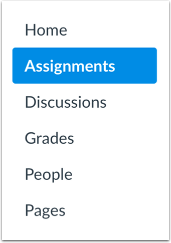 To manage an assignment group, click the group's Options drop-down menu . To edit the Assignment Group, click the Edit link . You can edit the Assignment Group name and the weighted percentage (if applicable). After you've added assignments to your Assignment Group, you can also edit the Assignment Group to set Assignment Group rules. To delete the Assignment Group, click the Delete link . To move all content from an assignment group into another group, click the Move Contents link . To move or reorder an assignment group on the Assignments page, click the Move Groups link . 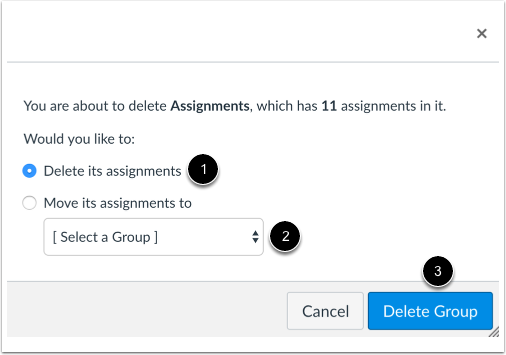 If you want to delete an assignment group that has assignments in it, Canvas will ask you if you want to Delete the assignments (default)  or move the assignments to another group . When you are finished, click the Delete Group button . Previous Topic:How do I move or reorder an assignment group? Next Topic:How do I weight the final course grade based on assignment groups? Table of Contents > Assignments > How do I add an assignment group in a course? Re: How do I delete an assignment category that I am not using?